Regiment/Catrawd: Royal Engineers (Railway Operating Division). Service Rank and Number / Rheng gwasanaeth a rhif: Corporal No. 109007. Military Cemetery/Memorial / Fynwent milwrol: Rhyl Town Cemetery. Ref No Grave or Memorial / Rhif cyfeirnod bedd: 361. Country of Cemetery or Memorial / Gwlad y fynwent neu gofeb: Wales, United Kingdom. Medals Awarded / Medalau a ddyfarnwyd: Did not serve overseas. Died from natural causes at The Red Cross Hospital, Ashbourne, Derbyshire, aged 34 years. James Owen Jones was born in Rhyl, Flintshire in 1882. The 1901 Census shows that the family lived at 14 Greenfield Street, Rhyl, Flintshire. The head of the family was James Jones aged 52, who was employed as a Brick Maker. His wife Jane Jones aged 52, a Self Employed Laundress and their three children – Elizabeth Jones aged 24, who worked for her mother as a Laundress, John W Jones aged aged 21, a Joiner and James Owen Jones aged 19, who was employed as a Plasterer. The 1911 Census shows that James has now married a Theresa Charlotte Williams amd they lived at Berkswell House, Prestatyn, Flintshire, where Theresa was a Boarding House Keeper. Some two years later they moved to 27 Hewitt Street, Saltney Ferry, Flintshire, where James obtained employment with the Railway Company as a Head Shunter. On Friday 14 July 1915 he enlisted at one of the Recruitment Centres in London with the Royal Engineers, but some seven months later he died at The Red Cross Hospital, Ashbourne, Derbyshire. His body was transported to Rhyl, Flintshire and he was buried in the Town’s Cemetery. 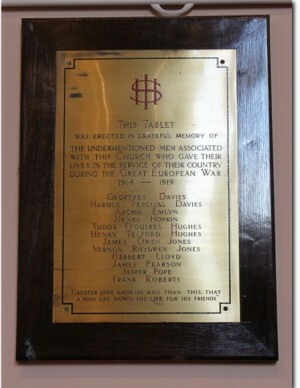 James Owen Jones is also remembered on a Remembrance Plaque at The Royal Alexandra Hospital, Marine Drive, Rhyl, Flintshire and on The North Wales Heroes Memorial Arch, Deiniol Road, Bangor, North Wales.